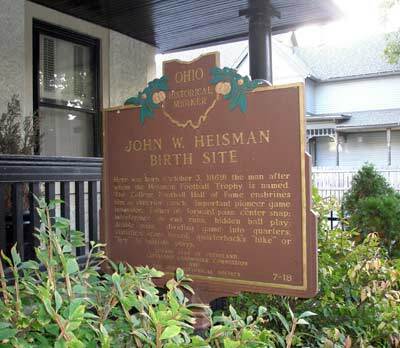 Where would you find the home where John W. Heisman was born? John William Heisman was born in this house in Cleveland, Ohio on October 3, 1869. He then grew up in Titusville, PA and went to Brown University and then Penn where, though small of stature he played offensive line on the football team. After getting his law degree, he took on the coaching job at Oberlin College. He also coached at Auburn, Clemson, University of Pennsylvania, Washington and Jefferson and Rice and his most productive coaching was at Georgia Tech (1904-1919)where he coached the team to 33 straight wins. Heisman was credited with many football innovations including the forward pass and having the center snap the ball to the quarterback. After retirement, John W. Heisman was named the first Athletic Director of the Downtown Athletic Club (DAC) in New York. This led to the DAC voting to determine the best college football player in the country. Jay Berwanger, a halfback from the University of Chicago was selected as the first winner in 1935. Before the next year's award could be announced, Heisman died and the Downtown Athletic Club award was renamed the Heisman Trophy. 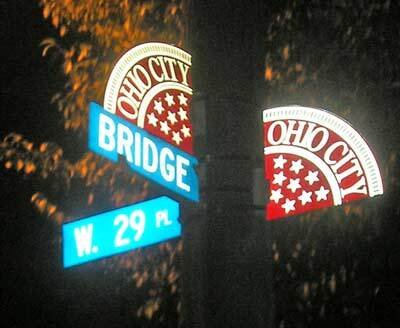 The home is at the corner of West 29th and Bridge in Ohio City, near the West Side Market. 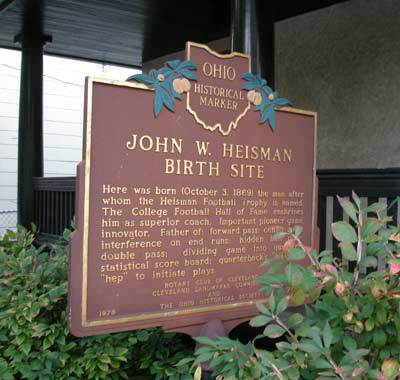 "John W. Heisman Birth Site"
Here was born (October 3, 1869) the man after whom the Heisman Football Trophy is named. The College Football Hall of Fame enshrines him as superior coach. Father of: forward pass; center snap; interference on end runs; hidden ball play; double pass; dividing game into quarters; statistical score board; quarterback's "hike" or "hep" to initiate plays. Cleveland's (Glenville High School) Troy Smith was the winner of the Heisman Trophy in 2006 and Desmond Howard (St Joseph HS) won the Heisman in 1991.